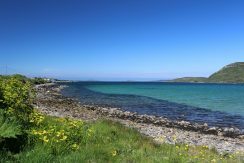 CLEGGAN: Pony Trekking, Traditional Music, Beaches, Fishing, Seaside Walks, Ancient Sites, Ferries to the Islands of Inishbofin and Inishturk from Cleggan Pier, Pubs, Restaurants. Highlight of the year is the Annual Cleggan Festival of the Sea. 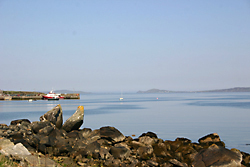 Cleggan is a busy working fishing village centred around its pier. Every day all the ferries come and go to Inishbofin from Cleggan, along with the small fishing fleet. 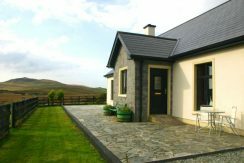 There is plenty to do in the area including popular walks to the top of Cleggan head. You will see the remains of a watchtower constructed during the Napoleonic wars, and ruined by hurricane Debbie in 1961 but still partially standing majestic.There are lots of other walks near Cleggan and many nearby beaches. To find Cleggan take the N59 from Clifden for 10km when the road bends sharp right there are signs for Cleggan, continue straight on. 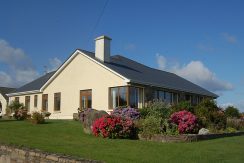 The village is located on part of the Wild Atlantic Way Whilst in Cleggan you can delight in the many vistas spread out before you including the islands of High Island, Cruagh, Shark, Bofin, Turk, Clare islands out to sea, the Twelve Bens mountains to the east and the distinctive hills of Mayo, Croagh Patrick and Achill Head to the north. Cleggan village is a lively spot with four pubs (Olivers, Joyces, Newmans, and The Pier Bar) There is traditional music regularly and an excellent restaurant in Oliver’s Bar and the Pier Bar. Near the pier you will find a well stocked general shop, a ticket office for the Ferry service to Inishbofin, and a shop selling marine supplies and fishing tackle. There is a kids playground next to the Cleggan community centre. There are two boats that cater for deep sea angling from Cleggan “Bluewater” and the “Western Kingfisher,” and they are also available for hire and Island trips. Near the Centre of the village is a thriving riding centre which accommodates riders of all ages and abilities (click here for website). Each year a festival of the sea is held. Cleggan is a working fishing village but but has been home to writers and poets such as Richard Murphy. 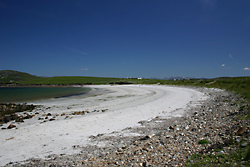 Cleggan is very central for the many lovely beaches in the area. 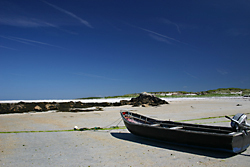 Email: info@inishbofinislanddiscovery.com The “Island Discovery” sails all year. The pier is the point of departure for ferry service to the island. It is only a 30 minute crossing from Cleggan to Inishbofin. The angling boat “Bluewater” (http://seafishingireland.net/also does charter trips to the Islands by arrangement and will guide your walk on the Island. 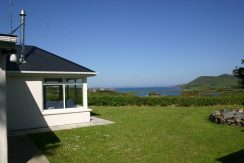 An amazing modern property on the shore of Cleggan Bay with far reaching views towards InishBofin Island. 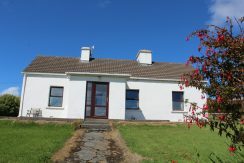 This cottage situated conveniently between the villages of Cleggan and Claddaghduff and is within easy walking distance of Rossadilisk beach.